On Friday, March 29, 2019, the William J. Perry Center for Hemispheric Defense Studies hosted a graduation ceremony for two courses: "Strategic Implications of Human Rights and Rule of Law" and "Combating Transnational Threat Networks." Students from all over the Americas attended the courses from March 18-29, 2019. 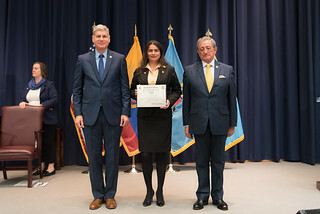 The graduation ceremony and reception took place in Lincoln Hall at the National Defense University's North Campus at Fort McNair in Washington, DC.